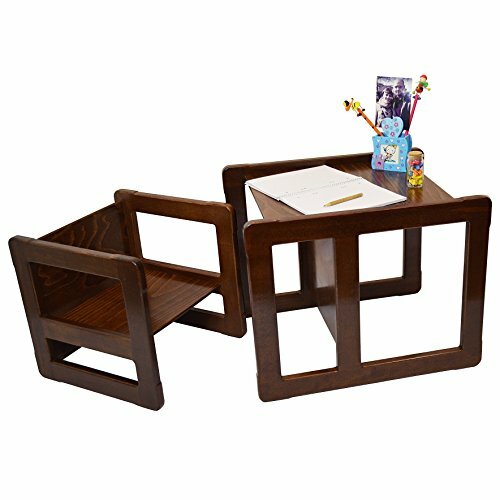 3 in 1 Childrens Multifunctional Furniture Set of 2, One Small Chair or Table and One Large Chair or Table Beech Wood, Dark Stained by Obique Ltd at Main Street Living. MPN: OB_SET_O_00021. Hurry! Limited time offer. Offer valid only while supplies last. Usage options of this 3 in 1 Childrens Multifunctional Furniture Set of 2, One Small Chair or Table and One Large Chair or Table Beech Wood are: 1. 1. Large Children's Chair with High Seat (Seat Height 32 cm) or Large Children's Chair with Low Seat (Seat Height 20 cm). 2. Small Children's Chair with High Seat (Seat Height 24 cm) or Small Children's Chair with Low Seat (Seat Height 14 cm). 5. Adult Nest of Two Coffee Tables (Table Top Heights 38 cm and 32 cm). This listing is for 3 in 1 Childrens Multifunctional Furniture Set of 2, One Small Chair or Table and One Large Chair or Table Beech Wood, Dark Stained.